I’m typically an egg, Greek yogurt, and toast (gluten free, more on that later) type of girl, but today I decided to jazz things up by making some oatmeal. Now, oatmeal is one of those things that tons of people like, even my less than healthy friends, but it’s really hard for me to eat. I’m a texture person and the whole soft, mushy, and hard factor really bothers me. 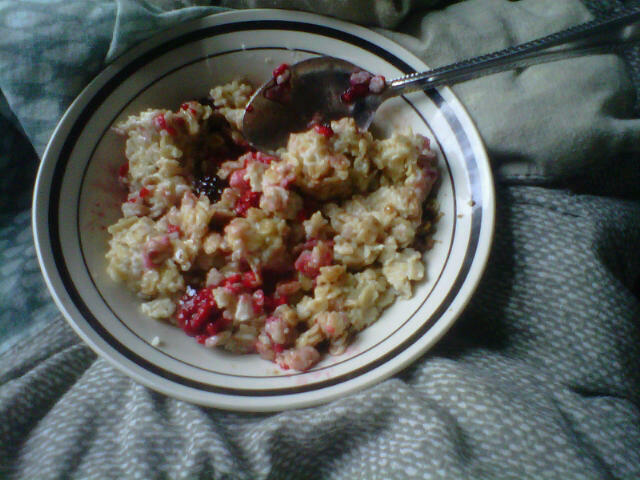 But…oatmeal does have a fair amount of good for you fiber, so I’m kind of forcing myself to like it. To make it more flavorful I’ve been adding my frozen berries (I hope you’re starting to realize that these are a useful freezer staple to purchase) and brown sugar or honey. I’ve been trying to cut back the amount of sweetener I use and someday I hope to only need a teeny, weenie drizzle; all in due time. Oatmeal is great to eat on days when you’re super busy and fear you won’t be able to eat lunch at your usual time, because it leaves you feeling full for a very long time and doesn’t take long to make. Check out this site for the many benefits oatmeal can provide, and try to avoid buying oatmeal that’s flavored for you. I checked on my persimmons to see if they were ripe yet. Sadly they have a few more days left. 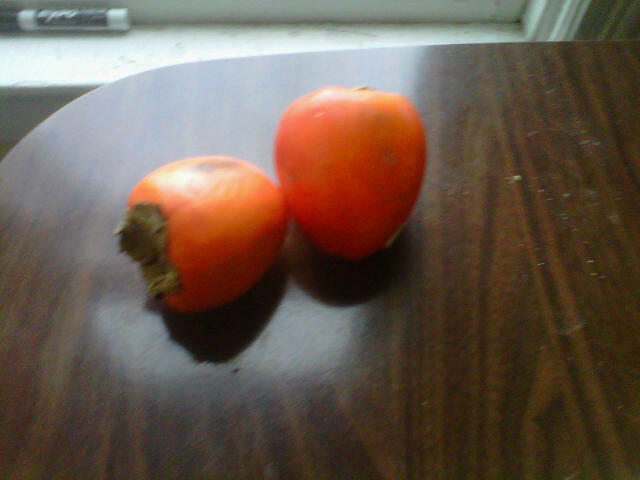 Persimmons are neat little fruits. I got two at the grocery store and looked them up online. They’re pretty popular in the California area. There are two main types of persimmons. One is squat, yellow, and known as a Jiro. These can be sliced and eaten raw while firm. The kind that is sold at most supermarkets I’ve been to is called the Hachiya. It’s a little larger, redder, and has a pointy bottom. The Hachiya is an astringent food, and an unripe Hachiya is apparently extremely bitter and will leave your mouth feeling fuzzy. Weirdly enough, the best time to eat them is once they’ve become soft and oozy. One of mine is finally starting to soften! You can put them in the freezer for a day, which helps kill the bitter taste, but I don’t mind waiting for them to do their thang. No worries. 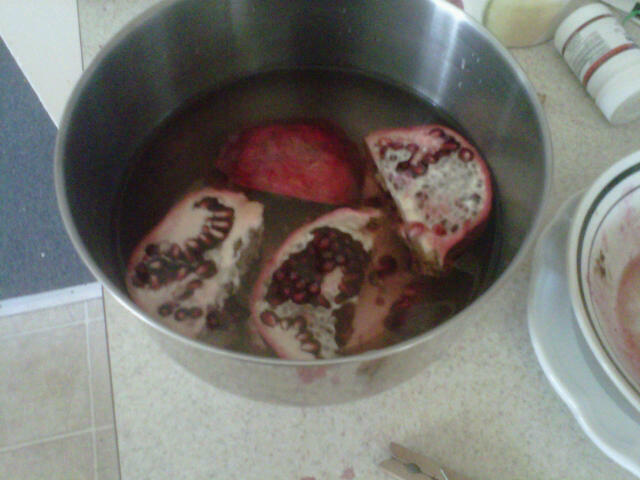 All was not lost, as I had a delectable Pomegranate sitting in my (now empty) fruit bowl. 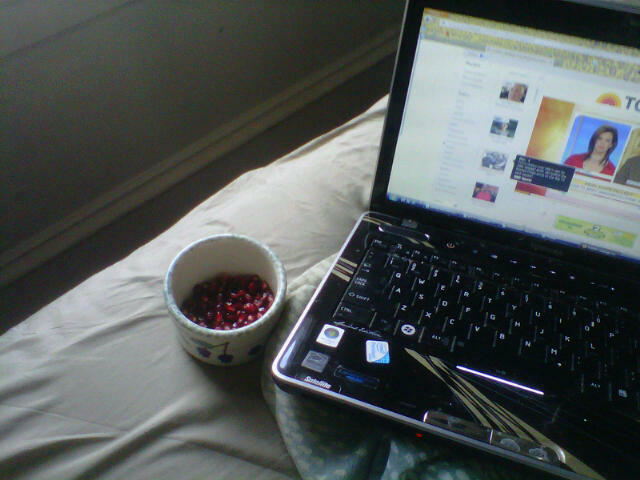 You’ve probably tried Pomegranate juice from the company POM, but have you ever had pomegranate seeds? 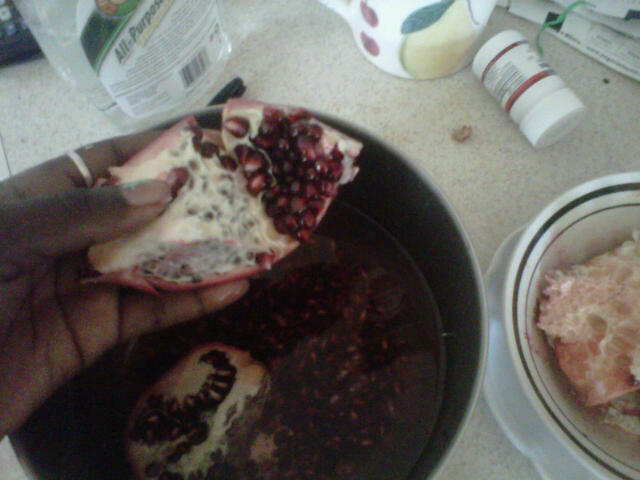 Known as arils, the red and hard, yet juicy, seeds are encased inside the Pomegranates inedible, white membrane. I was intimidated by these voluptuous beauties, but decided to buy them and do some online research of how to best open them. 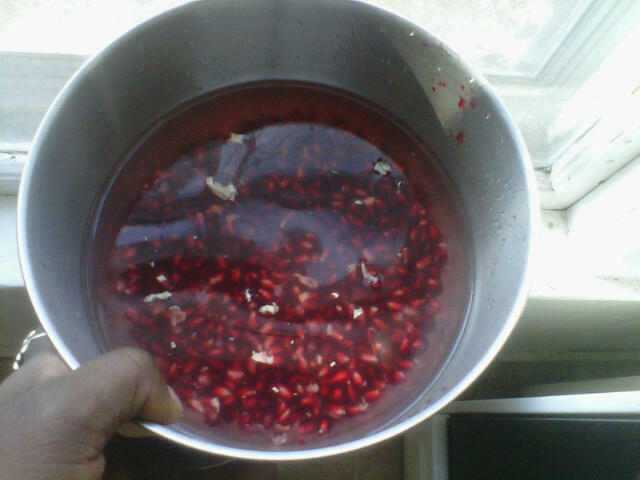 The consensus is to quarter the fruit and open it underwater so the arils plop to the bottom of the bowl and the membranes float to the top. It’s quite a fun process. Look for a large one with a dark red color. Those ones yield the most arils. Overall I’d say I had a pretty successful morning meal and my belly is quite satisfied.